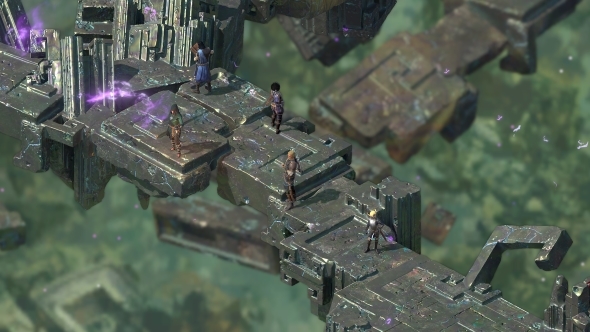 Pillars of Eternity II: Deadfire rethinks companions. As an RPG born from the Infinity Engine mould – which birthed Baldur’s Gate and Icewind Dale – a heavy emphasis is placed on party-based combat. Its predecessor replicated Baldur’s Gate’s combat perhaps a little too faithfully, creating a system that was not only deep, but often confusing. With Deadfire, the team at Obsidian aim to rectify those problems, leaving behind not only the problems of its predecessor, but making your companions smarter and more engaging to be around. Take a closer look at Pillars of Eternity II’s ship combat. Cleaner combat mechanics that don’t sacrifice the original game’s depth. A new AI system that provides more challenging enemies and smarter companions. The ability to write AI behaviour routines for your companions. A new multiclass system that allows you to craft highly diverse characters. Companions that can argue or even fall in love with both you and each other. First and foremost, a good RPG companion should have your back. Whether it is a bar brawl or a fight on the cliffs of eternity with a hydra, your party needs to be able to sling spells and fire arrows with calculated precision. This was not quite how it worked in the original Pillars of Eternity: the six-member party suffered from too many characters eager to get lost in the swirl of confusing afflictions, stacking rules, and spell particle effects. Combat was brutally difficult and far from easy to manage. “Part of the reason people play these games is they like the deep tactical combat,” Josh Sawyer, design director on Pillars of Eternity II tells us. “If you have a tactically deep game that’s hard to understand it’s pretty hard to have fun with it.” As a result of this thinking, Obsidian have aimed to clean up and clarify Pillars’ combat, maintaining depth but enhancing readability. The most dramatic change to the basic principles of combat is the fact that the party size has been reduced by one, down to five combatants. This helps you more easily keep track of every move being made, and eliminates the chance of there being a floating companion who offers nothing to the fight. “The goal was really to provide an increased amount of tactical depth, which I think we’ve achieved, while making it easier to understand,” Sawyer says. Obsidian’s changes drill deeper than just top-level changes, though. The surgery being performed on combat reaches right into the system’s cerebral cortex: the AI that powers both allies and enemies. 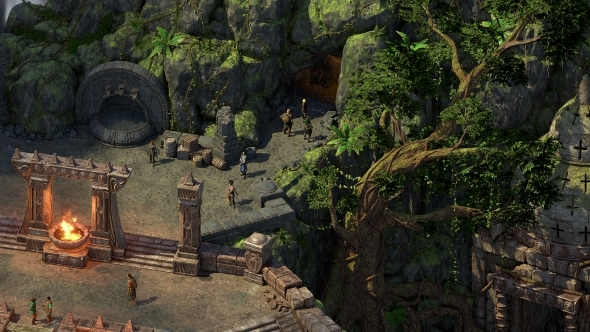 Sawyer admits that the first game’s logic was “fuzzy,” and the rewritten AI system – rooted in three layers of conditional logic – ensures Deadfire’s approach is clearer cut. In Deadfire you have complete control of every one of your companion’s AI routines. Using the system’s three layers of logic as a framework, you can dictate, for example, that when an ally suffers a poison status effect your party’s caster automatically performs a curative spell. That is the system at its most basic, as it comprises countless conditions which, when threaded together with companion abilities, creates a web of almost impenetrable intelligence. Create an AI plan for every eventuality and your team can become a self-sufficient combat unit. “We have great in-depth options, you can do lots of wild and crazy stuff,” Sawyer promises. The system has two very strong influences. “If you really like stuff like the Final Fantasy Gambit system or the AI settings from Dragon Age: Origins, those are the games we used as inspiration for Deadfire’s AI,” Sawyer says. For anyone not looking to spend hours rewiring the brains of each of their companions, a series of AI presets allows you a comprehensive but simpler method of governing AI behaviour. Each character has a primary and secondary set of rules, so should they be unable to do their most important actions, perhaps due to a status affliction, they will always have back-up procedures to fall back on. Possibilities in combat do not just come down to AI, of course: the skills of your character are dictated by your chosen class. If you have ever found yourself debilitated by choice while working through an RPG character creation screen, Deadfire’s new approach may help. Why have one class when you could have two? Why have just a class when you can subclass? Each class has between three and five subclasses, with each providing layers of lore and statistics for your character. These components slot into an improved RPG system that splits skills into active and passive categories, with levelling granting points to spend in both to ensure you can build both trees equally. The whole system allows for the creation of niche, focused heroes – rogues built specifically for DPS using daggers, for instance – or characters that have a broad library of abilities chosen from the trees of multiple classes and subclasses. Your character and companions’ place in Deadfire extends beyond a team looking to slice up everything in sight. 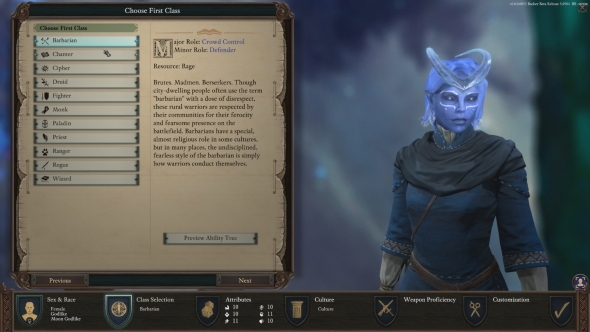 Story and relationships remain important to the Pillars of Eternity universe, and the sequel aims to bolster this by focusing more intently on the personalities that make up your band of adventurers. As such, you can expect your companions to contribute far more dialogue to your journey, chipping in on your decisions and reacting to events. And it is not just your party who have increased personality as Obsidian have put effort into making the whole crew of your seafaring headquarters feel alive and valuable. It is clear that the studio want you to consider their characters as more than just swords and chainmail, and to remember them for years to come. It is easy to get distracted by Pillars of Eternity II’s flashy new additions. The striking Deadfire Archipelago – the stage for grog-laden ship battles and tropical exploration – seems to promise a game cut from a very different cloth than the original’s traditional green and brown European leathers. But underneath the new additions lie more familiar elements that are receiving no less attention. From just a few hours of hands-on time with Deadfire it is evident that the new AI rules and combat changes have produced a far more enjoyable experience than seen in its predecessor. 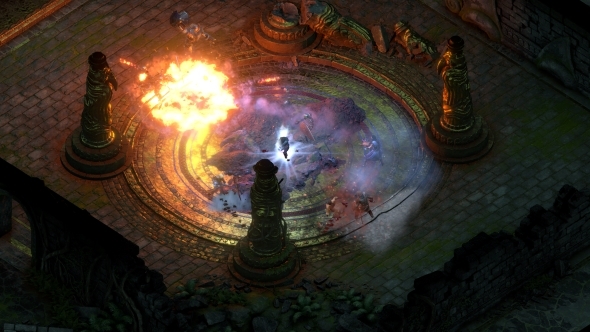 Deadfire is still Pillars of Eternity, and by extension still Baldur’s Gate: 21st Century Edition, and so yes, it still deserves to draw plenty of interest from fans of classic RPGs.